Global average temperatures are increasing, but this increase is not uniform across the globe. Different parts of the world are warming at different rates, and the effects of climate change vary from region to region. 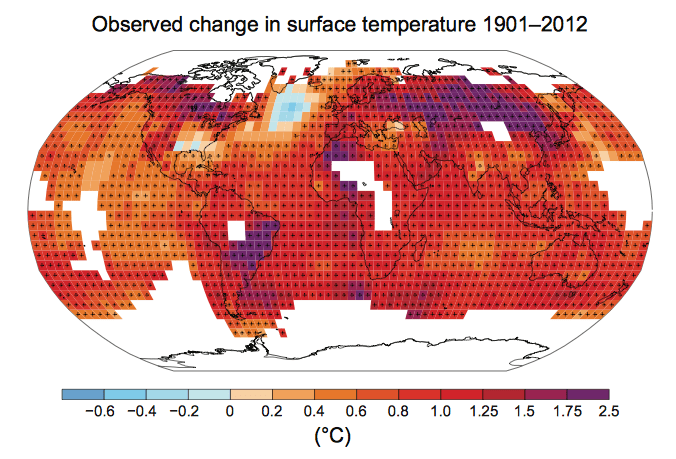 Mean temperatures have increased more over land than over the oceans. The Arctic is warming faster than the global average. Other regions, like the Sahel, are experiencing increased drought (1). One common observation can be made: all regions are experiencing change. Although the overall magnitude of climate warming varies from region to region in the world, the overall trend is that the planet as a whole is warming. Instrumentally recorded temperature data indicates overall temperature increases show a faster rate of warming occurring in recent years. Changes to precipitation patterns are also a signal of climate change, although these changes are harder to detect and are harder to attribute to specific triggers. Given that precipitation is an important source of fresh water for many regions on Earth, current changes to precipitation patterns and possible future changes are of great interest to the global community. Global average temperatures have increased by about 0.85 °C from 1880 to 2012 (1). In the Northern Hemisphere, 1983–2012 was likely the warmest 30-year period of the last 1400 years. (1). These temperature increases have been recorded instrumentally, and are the result of data compilation from around the world. Although different areas of the globe are warming at different rates, the trend is clear: the world as a whole is warming, and is warming faster now than at any time since we have begun recording temperature instrumentally. Changes to the amount of precipitation that certain regions receive, the kind of precipitation that falls (rain, snow), the distribution of precipitation, as well as the occurrence of more extreme precipitation events are all likely to occur as the planet warms. Changes in precipitation patterns can mean increased flooding in some areas, while others experience a greater frequency of drought. Potential changes to the amount and distribution of precipitation is of great interest to all regions of the world. Precipitation is of vital importance to the maintenance of our water resources. The uncertainty of how precipitation patterns could change in the future makes adaptation efforts difficult.